Phra Nang Inn is located on the Ao Nang Beach, set among lust tropical garden with the best panoramic view of Krabi’s islands, and only a short stroll away from the shopping & dining strip of Ao Nang Beach. 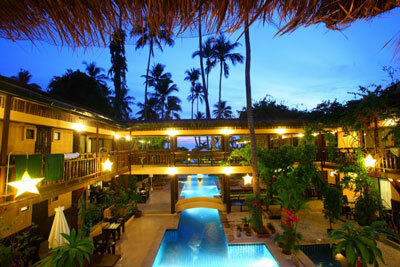 Established since1987, Phra Nang Inn is one of the first hotels in Krabi. We have undergone a complete renovation in 2007, pffering a fresh touch while maintain the old charms that are uniquely Phra Nang Inn. We offer characterized accomodations with friendly and personalized services. The guest rooms are decorated with local materials such as seashells and coconut wood together with fresh colors to create a unique and refreshing atmosphere. Phra Nang Kitchen : This lovely open-air dining room opens daily from 7:00 am – 10:00 pm. With only a few steps from the Ao Nang Beach, you can enjoy a wide selection of Thai and Continental cuisines from our a la carte menu. The Barefoot Grill and Martini Bar : Take your shoes off and enjoy the best grill in town! From the freshest seafood to a juicy steak, we promise to give you only the best ingredient. While you are enjoying the food, give in to the temptation of the best of all cocktailsย…the Martinis! The Sunset Balcony : Second-level open-air balcony with panoramic view of the Andaman Sea, offering exotic cocktails and refreshment along with selections of light meals and snack. The Bar : An Open bar opposite the Ao Nang Beach, offers delicious light menu as well as extensive cocktails and refreshments.